A two-week delay between posts only means one thing: Christmas vacation and New Years. Lots of time with family and then a two-day trip to Washington, D.C. to try to put a Folding Bike User's Bill of RIghts into the then-pending fiscal cliff package. 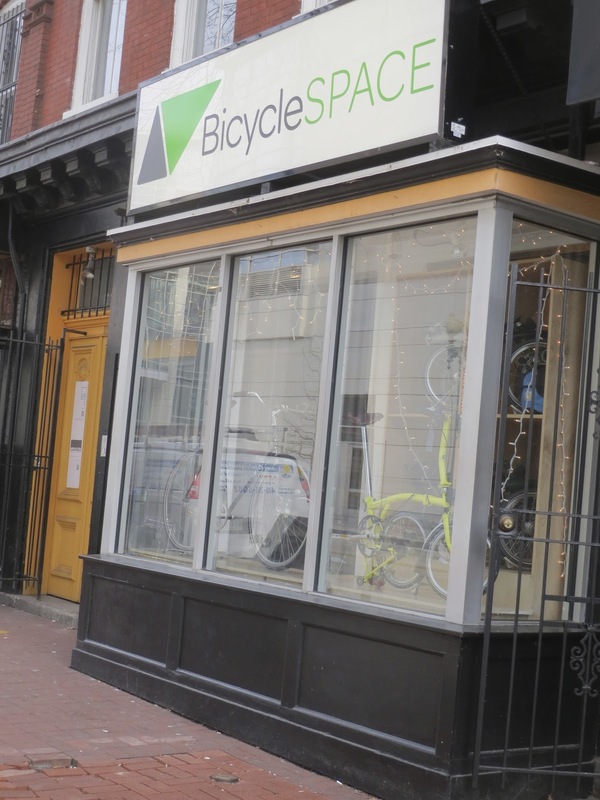 Or, perhaps, I went to D.C. to steer clear of Capitol Hill silliness and visit bike shops. The outstanding Bicycle Space happened to be open and was having a sale, so I left the shop with a lighter wallet and a heavy bag. That bag weighed nothing compared to the massive canvas one that my Dahon was packed in. Even though my wife and I had very little time in D.C. I like bringing a bike with me even when I'm not sure when I'd use it. Sadly, the bike stayed hidden in its bag at our room in the Dupont Circle Hotel the whole time we were there (when checking in, the staff must have thought we were staying a month). But our schedule didn't allow for a ride. After a walking tour of D.C. and visiting Bicycle Space and other open shops (that my wife likes), we went dancing at Glen Echo Park that evening. By morning, even though the first day of 2013 began with fairly mild temperatures and deserted, if not post-zombie apocalypse roads, there was not to be any biking in D.C. But on the way back to Stamford, my wife thought it would be nice to stop at Annapolis, Maryland. This was great in that it meant the Dahon would see the outside of its bag for the first time since I packed it in, but I wasn't able to learn anything about the city before a brief, <1 hour ride there. So if there are parents out there who have helped his or her child with a science fair project the morning it is due or bluffed their way through a book report in grade school, you'll have some idea of what kind of post this is. Okay, so, uh…the first thing someone from the Northeast has to do upon arriving in Annapolis is perform a Crab Chip recon mission. You see, Old Bay seasoned potato chips - particularly the excellent "The Crab Chip" bags from Utz - are almost impossible to find in New England. Because a shocking number of shops in downtown Annapolis were open on New Year's Day (thank you, small business owners) I was able to engage in one of my most successful Potato Chip Gathering missions yet. 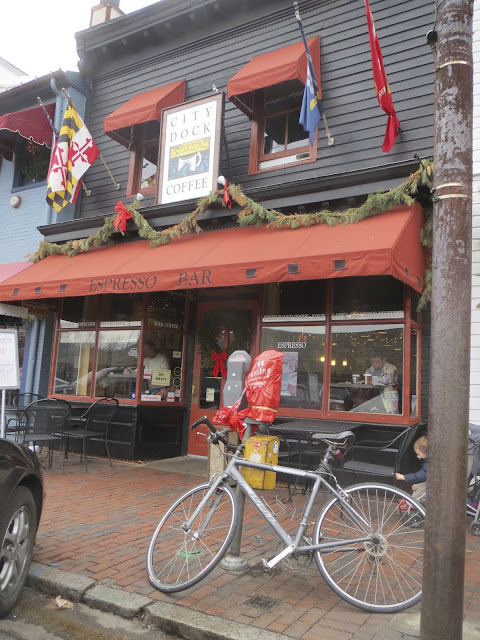 There's also good coffee to be had at the nearby City Dock Coffee. I bought a pound of beans to take home. 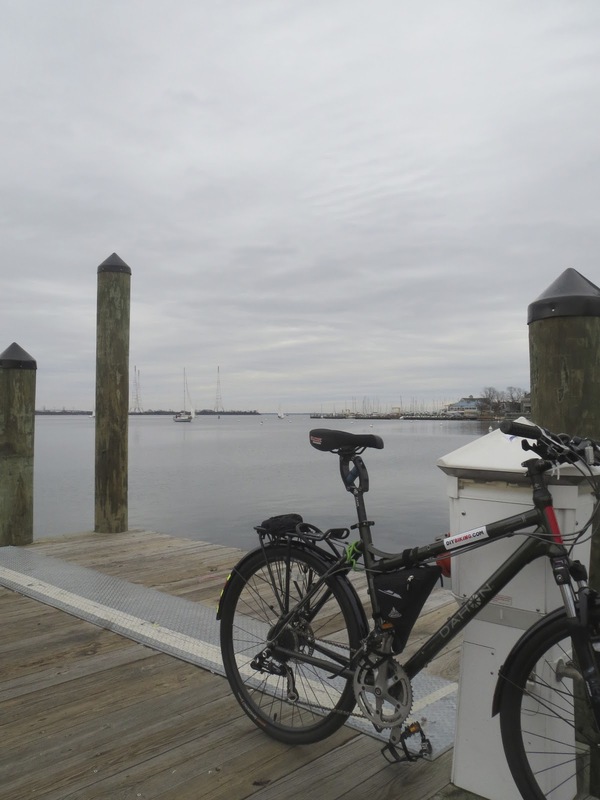 With the six-month supply of salty snacks and a 10-day supply of coffee packed away, I pedaled about, starting at the docks…which are very well known for being near the water. A short distance away, on what was probably one of the outside walls of the famous Naval Academy on the corner of King George Street, I saw a beautifully painted mural - and I did not lean the bike against it when I took this photo. While pedaling towards the U.S. Naval Academy Bridge, I passed a group of cyclists heading in the opposite direction. That was a good sign, I thought. Upon arriving at the bridge, I noticed a wide bike lane…which was another good sign. It was a steep climb to the top but a fun ride down the bottom and a nice view in between. The terrain ahead looked like rolling hills but I again saw more cyclists. There was also a great deal of signage reminding people that bikes were around, and even one that shows that it is either okay for cyclists to run down pedestrians or that people on foot sometimes drag cyclists across roads by their front wheels. I looped under the bridge to see Jonas Green Park - which offers a fishing pier that no one was using that morning and a kayak launch a paddle boarder was using - before heading up to the World War II memorial, which offered another view of the river and of Annapolis. Now closing in on lunchtime - and the moment I was supposed to meet my wife - I sped down the hill and climbed the bridge once again. About halfway up, I found a small Christmas wreath on the side of the road - one that had apparently fallen from the radiator of a car at some point. Reasoning that it was both litter and that it would look good on the handlebars of the Matrix, I picked it up and was in the process of attaching it when a guy on a road bike - with a jersey that read 'Bike Doctor' - asked if I needed help. I thanked him and said I was fine, and he promptly resumed climbing the hill. Who was this mysterious and helpful person? Was he with the group I had seen earlier? Both were good questions this trip wouldn't answer. Pedaling back into town, I ended up near an entry point of the Poplar Trail…a trail that is…friendly to cyclists and pedestrians. From what I learned on the state's web site, it is a short trail (about 2,400 feet long) but serves an important function as it provides access to two elementary schools. A safe way for kids to ride to school and hopefully dodge the child obesity epidemic. Are you listening, America? Finally, it was time to end the ride. At eight miles, it was barely a warm up, but at least I got to start 2013 with a fun ride in an interesting place. While eating lunch at Buddy's Crabs & Ribs, I was again reminded that there was a lot more to Annapolis than I had seen, and I'm not just talking about the good food. I looked outside the window where we were dining and saw another big group of cyclists go by. When I went on a 20-mile ride on New Year's Day in Fairfield County a year ago, I saw no one on a bike. Annapolis, even though I was unable to find a bike shop and didn't have the time to look up local cycling clubs, seemed to have it together. But that wasn't all: shortly before the check, another cyclist went by who was not part of the earlier group. He was by himself, and I had to scramble to get my camera out to take his picture. It was then I was completely convinced that there is a lot more to Annapolis and the cycling culture there than I knew, and that I needed to return one day soon for a more thorough post. In the meantime, if you go, try to ride more than eight miles, stay more than a couple of hours, and figure out how this thing was made. Thanks for reading and thanks for riding.